Meet the new PL-14 9x19mm pistol, also called the “Pistolet Lebedev” (Пистолет Лебедева), after its designer. This new pistol comes from Russian arms-maker Kalashnikov Concern. Notably, it is designed for both sport and war. Two versions will be produced — one for military use, and another for competition. The match version will have a lighter pull-weight trigger. 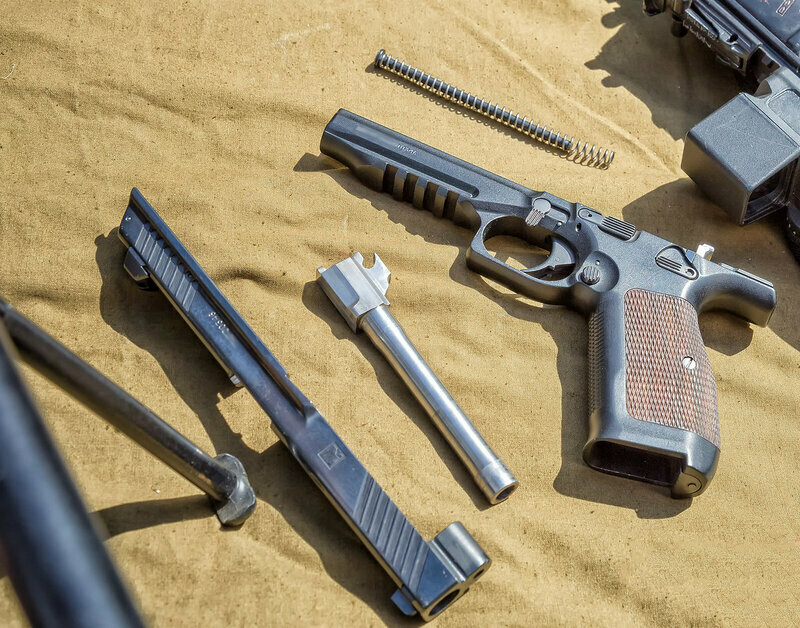 “The versatility of our new pistol allows [use] not only as a military weapon for the military forces and police, but also as a pistol for different shooting competitions,” said Kalashnikov CEO Alexey Krivoruchko. This new pistol was developed with input from both IPSC shooters and Russian Special Forces (Spetsnaz) soldiers. A lot of smart thinking went into this ergonomic design. We were pleased to see the ultra-low bore axis and a grip that does NOT copy the worst features of the Glock design. Fully loaded, the PL-14 weighs 1 kg (2.2 lbs). The PL-14 prototype frame is aluminum. We’re informed that the production military version will have a polymer frame. Share the post "New 9mm Sport and Combat Pistol from Kalashnikov"
Camp Perry is coming up very soon. If your shooting jacket has seen better days… consider getting a new Monard coat. Here’s a report from our friend Shawn McKenna, a talented High Power competitor. A few years back Shawn ordered a Monard custom-fitted shooting coat. He liked Monard coats so much he decided to sell them. For years and years, like most High Power shooters, I used an “off the rack” shooting jacket and thought I was happy with it. There may have been one or two adjustments the supplier would accommodate during ordering, but by and large it was like wearing a suit that you bought without the benefit of having it tailored. Share the post "Gear Report: Monard HP Shooting Jacket"